La cysticercose bovine est un problème majeur de santé publique, en particulier dans les pays en développement. Elle est causée par les larves du cestode Taenia solium (pork tapeworm). Il se présente généralement comme une lésion solitaire dans le muscle ou du cerveau (neurocysticercose). La cysticercose disséminée est une manifestation rare, en particulier dans un individu immunocompétent. Nous rapportons le cas d'un 31 ans qui présentaient une apparition nouvelle tonico-cloniques et qui avaient également plusieurs gonflements des tissus mous sur tout son corps. Les études d'imagerie ont révélé plusieurs cysticerques dans le parenchyme du cerveau, des muscles extraoculaires, et les muscles de l'ensemble des quatre membres, qui a été établi par l'histopathologie également. Le patient a commencé à prendre des anticonvulsivants, stéroïdes, et de l'albendazole à la suite de laquelle il s'est complètement rétabli. Cysticercosis is a public health problem and rampant in developing countries of Asia, Africa, and South America. It is caused by the larvae of pork tapeworm (Taenia solium). It is transmitted to humans by the consumption of raw or undercooked pork. The eggs of the tapeworm enter the digestive tract and hatch to release the larvae which then reach the bloodstream through the hepatoportal system. The larvae usually lodge in the muscles or the brain and cause symptoms depending on their location. The usual presentation is of a solitary lesion in the muscle or the brain. Disseminated cysticercosis (DCC), a condition where the cysticerci are found throughout the body at various sites, is usually seen among individuals with an immunocompromised state. DCC in an immunocompetent individual is extremely rare, with about fifty cases being reported in medical literature. Around twenty cases of DCC have been reported from India. A 31-year-old male presented with two episodes of new-onset generalized tonic–clonic seizures (GTCS) involving all four limbs, each episode of about 1 min duration, associated with urinary incontinence followed by a postictal drowsy state lasting for about 20 min. There was no history of seizures, no significant comorbid illness, no drug intake, and no family history of seizures. At the time of admission, he was conscious and oriented and his vitals were stable. He did not have any cranial nerve deficits or focal neurological deficits of the limbs. His other system examinations were unremarkable. He had multiple soft swellings spread over the face, both upper limbs, upper chest, right flank of the abdomen, and the left lower limb which were soft, nontender, and nonmobile. The largest of such swellings measured 2 cm × 2 cm on the left forearm. His baseline investigations were within normal limits. He was stabilized in the emergency and was started on anticonvulsants (intravenous phenytoin loading followed by maintenance dose after which he was switched over to oral phenytoin). He had further two episodes of GTCS on the same day and one episode on the next day. 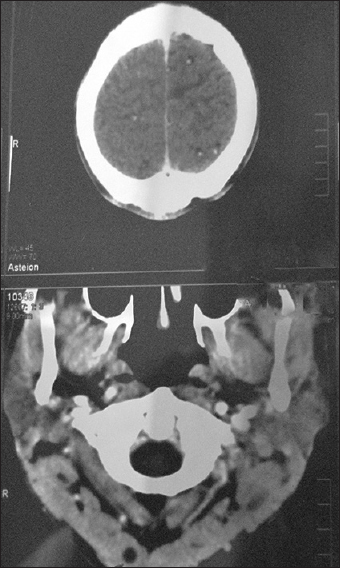 Computed tomography (CT) of the brain with contrast [Figure 1] showed multiple discrete enhancing lesions with surrounding halo effect. Similar cystic lesions were also made out in the muscles of the neck and sternocleidomastoid muscle [Figure 1]. 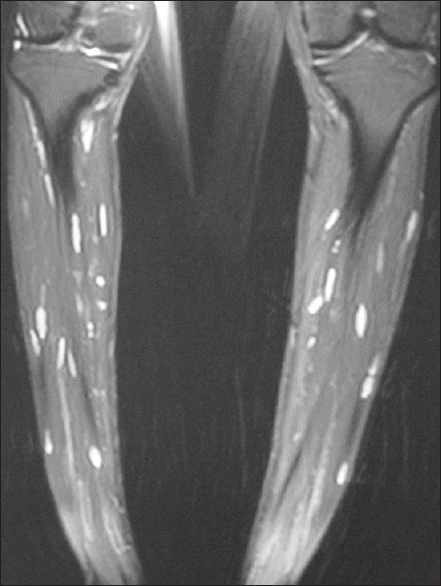 The possibility of myoneurocysticercosis was considered, and the patient underwent further imaging studies. Magnetic resonance imaging (MRI) of the brain and the limbs [Figure 2], [Figure 3], [Figure 4] revealed multiple lesions suggestive of cysticerci in the brain parenchyma, extraocular muscles, and muscles of all the four limbs. He was diagnosed to have DCC. He was screened for HIV after consent and was found to be negative. Fundus examination did not reveal any intraocular cysticerci or papilledema. 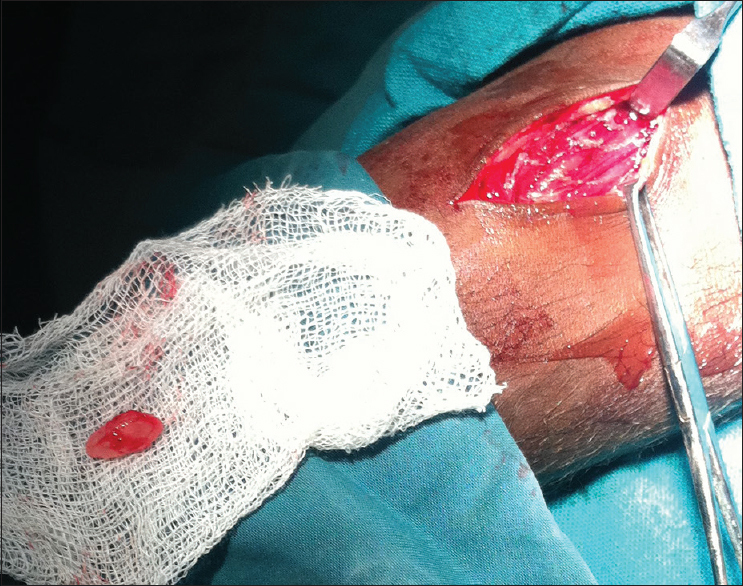 He underwent excision biopsy of the lesion located in the left forearm [Figure 5] for further confirmation of the diagnosis. Histopathology confirmed the diagnosis of cysticercosis. He was continued on anticonvulsants and started on albendazole along with tapering dose of steroids over 4 weeks (initial oral prednisolone 30 mg/day). He was discharged from the hospital after being seizure free for 72 h. At the end of 4 weeks, the patient came for follow-up. The skin lesions had completely resolved and there were no further episodes of seizures. Albendazole was stopped. Anticonvulsants were advised for 6 months after discussion with the neurologist. The patient was on regular follow-up for 6 months and had no further seizure recurrence. Human cysticercosis is a major public health problem both in resource-poor and in developing countries. It is the single most common cause of epilepsy in most of South and Central America, India, Southeast Asia, China, and Sub-Saharan Africa. Human cysticercosis is caused by the dissemination of the embryos of T. solium from the intestine via the hepatoportal system to the tissues and organs of the body. Although cysticercosis is quite common, DCC with multiple organ involvement is rare. Clinical features of DCC depend on the localization of the cysts in the body, the degree of parasite burden, and the host–parasite interaction. In cysticercosis, the central nervous system is most commonly involved (97.46%), followed by involvement of the eyes (1.4%) and skin and soft tissues (1.14%). Hence, the most common presenting feature in the patient is recurrent episodes of seizures. The involvement of subcutaneous tissues presents as palpable subcutaneous nodules while myalgia, weakness, or pseudohypertrophy may be seen with diffuse muscular involvement. MRI is considered as the best imaging tool for cysticercosis. The advantages of MRI over CT are that it can identify the various stages of the parasite more accurately and avoids the associated radiation exposure. The presence of a scolex inside a cystic lesion usually suggests the diagnosis of cysticercosis. A failure to see the scolex in neuroimaging studies should prompt the search for an alternate diagnosis. In developing countries, where both the diseases are endemic, tuberculoma remains the single most important differential diagnosis., The differentiation can be achieved with the help of MR spectroscopy. Management of DCC includes symptomatic treatment of the central nervous system lesions using steroids and antiepileptic medications. Pharmacological management is with the use of cysticidal drugs such as praziquantel (10–15 mg/kg/day for 7–21 days) or albendazole (15 mg/kg/day for 28 days) which help in reducing the parasite burden. The drugs can lead to death of the parasites which may lead to rupture of the cyst wall. This leads to severe antigen–antibody reactions which may lead to enlargement of the cysts, local tissue swelling, and sometimes even a generalized anaphylactic reaction. These effects are usually more damaging in patients who have neurocysticercosis as it may paradoxically manifest as increase in seizure frequency. These reactions are usually minimized by the concomitant use of corticosteroids before starting the cysticidal drug. This case is presented to highlight the rare manifestation of a common disease in developing countries. It is important to make the diagnosis by differentiating it from other similar causes and be aware of the side effects associated with the treatment. Bhalla A, Sood A, Sachdev A, Varma V. Disseminated cysticercosis: A case report and review of the literature. J Med Case Rep 2008;2:137. Bern C, Garcia HH, Evans C, Gonzalez AE, Verastegui M, Tsang VC, et al. Magnitude of the disease burden from neurocysticercosis in a developing country. Clin Infect Dis 1999;29:1203-9. Zammarchi L, Strohmeyer M, Bartalesi F, Bruno E, Muñoz J, Buonfrate D, et al. Epidemiology and management of cysticercosis and Taenia solium taeniasis in Europe, systematic review 1990-2011. PLoS One 2013;8:e69537. Bandyopadhyay D, Sen S. Disseminated cysticercosis with huge muscle hypertrophy. Indian J Dermatol 2009;54:49-51. Del Brutto OH, Rajshekhar V, White AC Jr., Tsang VC, Nash TE, Takayanagui OM, et al. Proposed diagnostic criteria for neurocysticercosis. Neurology 2001;57:177-83. Lu Z, Zhang B, Qiu W, Hu X. Disseminated intracranial tuberculoma mimicking neurocysticercosis. Intern Med 2011;50:2031-4. Garg RK. Single enhancing computerized tomography-detected lesion in immunocompetent patients. 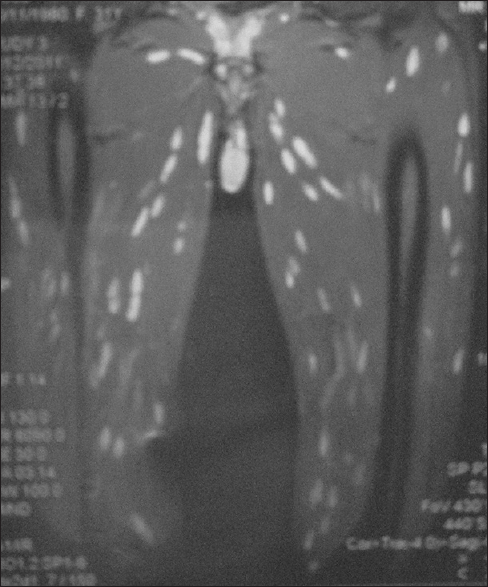 Neurosurg Focus 2002;12:e4. Bothale KA, Mahore SD, Maimoon SA. A rare case of disseminated cysticercosis. Trop Parasitol 2012;2:138-41. Banu A, Veena N. A rare case of disseminated cysticercosis: Case report and literature review. Indian J Med Microbiol 2011;29:180-3.